Tablet with no GSM voice communication capabilities. This is not a GSM device, it will not work on any GSM network worldwide. Fast, smart, versatile and filled with entertainment in a portable package, the Flyer is the first tablet from HTC and is a unique portable package that looks good and feels great. Wrapped in a high-quality aluminum unibody chassis the Flyer weighs 420g, about the same as a large paper-back book. The bright and responsive 7 inch 1024 x 600 resolution capacative touchscreen is controlled by your fingers; swiping, pinch-zooming, and flicking around HTC's refreshed Sense interface is incredibly responsive. However, the HTC Flyer comes with an innovative and versatile stylus pen for a deeper layer of interactivity and digital ink. If you can see it, you can draw on it; annotate documents, highlight text, and draw pictures. Underneath there is a lightning-fast 1.5Ghz processor, 1 GB of RAM, high speed Wi-Fi and Bluetooth 3.0, not to mention full Flash support and a microSD card slot, so surfing the internet, running apps and general tasks on the Flyer are unbound and incredibly smooth, and it can power serious gaming on the go. HTC Watch gives you access to Hollywood movies and TV on the move, and gamers will love OnLive which can stream games straight to your Flyer. A fast, portable, lightweight tablet that takes gaming to the next level. 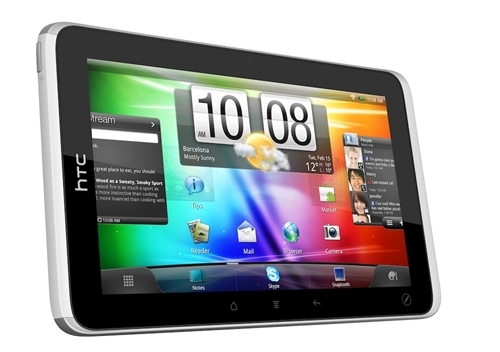 Encased in a sleek aluminum unibody, the HTC Flyer tablet exudes the iconic style and build quality HTC is known for. It is also ultra-light, weighing as little as a paperback book, and compact enough to fit in a jacket pocket only. 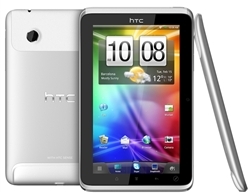 With a seven-inch display, lightning fast 1.5Ghz processor, the HTC Flyer tablet is perfect for those who have been waiting for a tablet that is both compact and powerful. Conveniently compact and light for travel, yet amazingly powerful, the HTC Flyer tablet with a 7" display and a superfast 1.5 GHz processor is perfect for web browsing at home, in the car or on a business trip. To make it even better, it features Adobe Flash support, multi-window browsing with pinch to zoom, and a clever quick look-up that lets you tap into Wikipedia, Youtube and other web resources. No more hunting around for stuff, anything you want will come to you on a cool 3D carousel. Photos, entertainment, weather, calendar, mail, friends smoothly roll around at your fingertips, front and center, while giving you a sneak peak of what's to come. Whether you're stuck in traffic, working late, or halfway around the world, you can make live video calls to those closest to you on your HTC Flyer straight from your contact list. So you can say it in person as if you're face to face, no matter if they're on their PC at home, on their office computer or on the other side of the world using their HTC Flyer.